The Australian Standards recommend a termite inspection at least every 12 months. 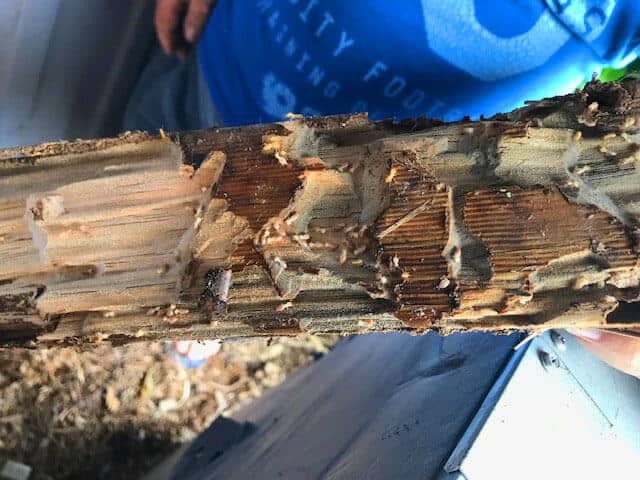 A complete and thorough termite inspection includes a 10-14 page written report (single page reports are not detailed enough information to provide a proper inspection report). Call our specialist technicians now to arrange a free quote for a termite preventative treatment or a thorough visual termite inspection. Don’t delay, ring Pest Control North Brisbane (PCNB) today on 1300 442 978. We do pre-purchase inspections, standard timber pest inspections (visual termite inspection), termite treatments, preventative treatments, and we will provide free expert advice to assist you in making an informed decision about what is best to protect your home. We at PCNB understand that your home is a lifetime investment, and we are happy to advise you on how to protect it. When we do a timber pest inspections on your home. We report on all timber pests including termites (white ants), borers, wood decay/fungi, and chemical delignification. Destroying your home one bite at a time. Termites, or white ants as they are sometimes referred to, are pests that can eat away at your woodwork (even a steel frame home has skirting boards, cupboards, and gyprock). If you identify one of these pests it is natural to look for more in your home or yard and try to find the source. Disturbing them, however, could make the situation much worse, and make treatment more complicated. This is where it is VERY important to call the experts at PCNB to help protect your house. We are professionals and know exactly how to find their entry points, commence treatment, and advise you the best possible course of action going forward to treat and/or protect your home. Termites are referred to as subterranean termites as they have to have contact with the soil. Subterranean termites are the most destructive and aggressive of the termite species which can infest your home. When we do a complete Termiticide ‘Termite Management System’ (TMS), we treat all areas that are in contact with the soil around the exterior of the home (and sometimes other areas, depending on the structure of your home), we saturate the soil with a high volume of chemical (applied in accordance with the Australian Standards and label application rates). We do this because subterranean termites need with the soil to survive, therefore if the soil is treated around your home it creates a situation (depending on the chemical used) where the termites are either repelled away from your home (repellent chemicals such as Bifenthrin), or a situation where when they come into contact with the chemical, they cannot detect it’s presence, but the chemical has a deadly transference effect which will wipe out the colony foraging towards your home before it can become established in your home (Fiprinol). If the structure of your home is on a sloping block, or is built on different levels rather than a reasonably flat gradient, then a baiting and monitoring system might be a more effective preventative measure for your home. 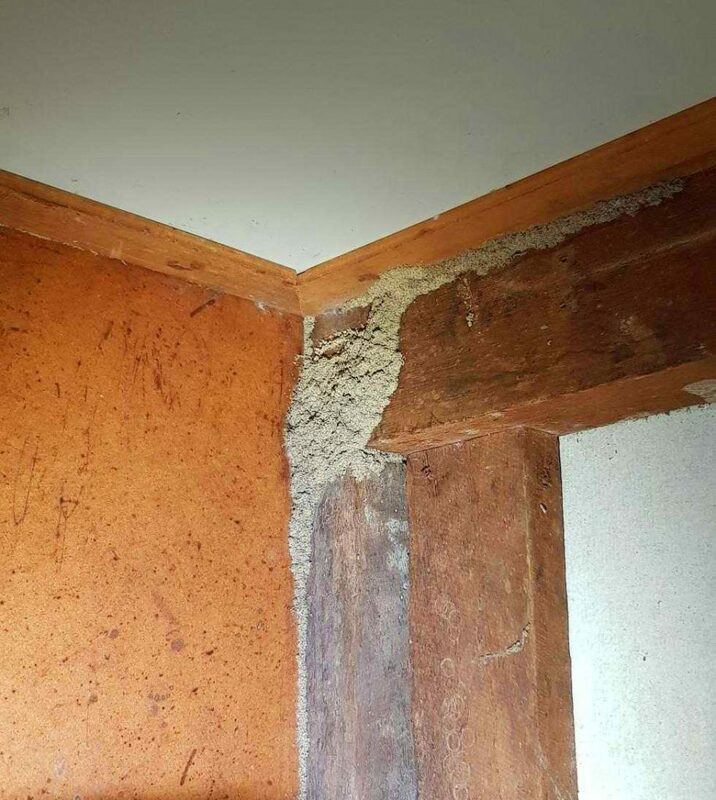 Some of the tell-tale signs that you may have termites include, hollow sounding/changes to the timber, the noise of insects moving about in walls (this is often thought that you can hear them eating, but they actually shake their exoskeleton), discolouration/peeling of paint, and of course seeing the termites themselves. 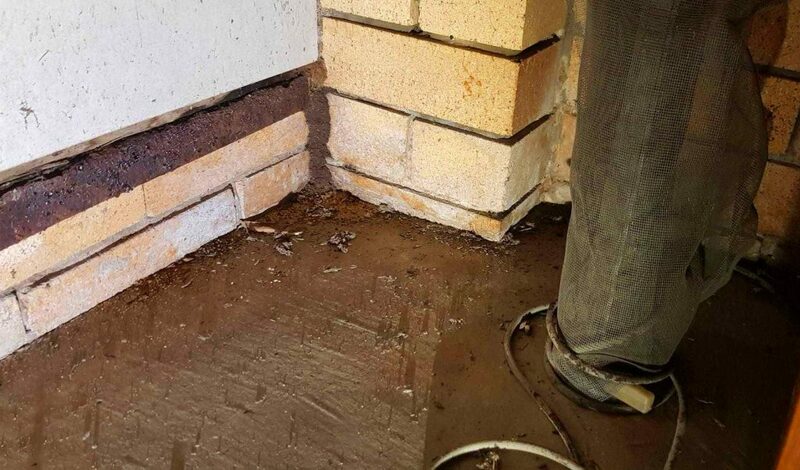 If you suspect you may have termites, give PCNB a call immediately so we can help protect you before the problem gets worse on 1300 442 978. There are many different types of borer found in timber in South East Queensland. The most common bores in this area are Pinhole Borers (Ambrosia Beetle), Powder Post Beetle (Lyctus Brunneus), Queensland Pine Beetle (Calymmaderus Incisus), Auger Beetles, Longicorn and Jewel Beetles. Borers can do large amounts of damage to the timbers in your home, but will only do so over a long period of time. However, if you notice borer activity appearing in your furniture, roof timbers, floor timbers, cupboards and more, it is important to treat them as soon as you locate their presence. If left untreated not only will they continue to destroy the timbers they are currently inhabiting, they can spread to other timbers in your home. It can be difficult to tell if borer damage is current or old. An experienced pest technician will be able to assist with identification of species and activity. Chemical delignification is when the lignin in the timber is destroyed. Lignin is nature’s ‘glue’ that binds the cells that make up the timber components together. When chemical delignification is occuring, the timber gradually breaks down and can collapse when the timber becomes defibrated, as the fibres within the timber detach once the lignin is broken down. SOME HELPFUL HINTS FOR TERMITES……. Minimise entry points for more termites to enter your home by, keeping piles of debris/gardens/clutter away from the external walls of your home. This can help prevent termite attacks. Don’t assume all termite management systems or remedial treatments are the same. There are many options which depend on your specific situation/house and vary in their price, odour, toxicity and effectiveness. Attempt any treatments of your own, the treatment must reach the nest in the soil. Surface treatments/disturbances will only make them close off that area and come up somewhere else. You could end up making the situation worse. Think that the problem will sort itself out. No matter what termite infestation you have they will continue to feed, and the longer it is left they will continue to do damage to your home. Stumps/trees with active termites must be treated before they are removed and taken away. 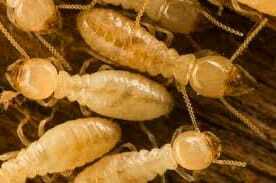 Subterranean termites always have their main nest in the soil, and other termites out foraging for new food sources. If stumps/trees are removed without treating them, you have only taken away the food source, not the termite issue.